Please sign my guestbook and be sure to let me know that you have placed my Weblink logo on your page. If you have any problems, please email me. I will notify you once you are added. Here is the CODE to put WebLink onto your Homepage. I have attached a HTML file and you can open it in your browser by saving it in a folder and opening the file in your browser. Then you need only copy and paste the code onto your homepage. Be sure to change the items which is in red in the code below to your: guestbook URL and the guestbook name, then your URL, and then email address and your name ( ALL OF WHICH WOULD BE IN PLACE OF MY INFORMATION WHICH YOU SEE LISTED). If you do not have a guestbook then leave as is. Be sure to save the logo.gif and tepee.gif saved to your hard drive. All that is left is for you to upload the two gif's and your page. 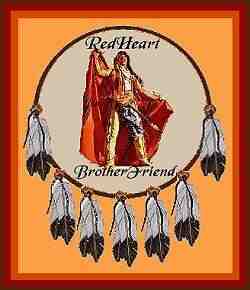 You are also welcome to see listing of all Native American Indian Weblink members who do not have home pages but wish to link thru their E-Mail addresses. Let us not omit them. We are all Brothers and should be treated as such.